Experts dedicated to your complete protection and satisfaction. Four filtering levels: None, Low, Medium, High. First DNS service with military-grade encryption. Over 19 years of experience. Block unsafe and unwanted web sites. HTTP(S) support. Secure online banking, passwords, and confidential information. Automatic installer. Turnkey SDK and service. Automatic configurator. Multi-platform support. Fastest and most reliable DNS service. 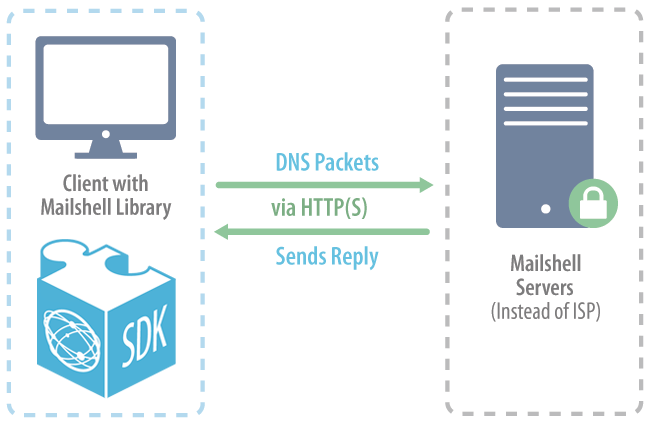 Clients using the Mailshell DNS SDK library have a safer and more reliable method to resolve DNS requests by sending DNS packets over HTTP(S) to Mailshell servers for decoding and extracting.